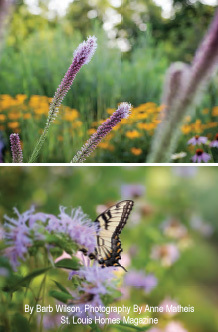 This knockout garden embraces native plantings to create a breathtaking beauty on seven acres. In the early 1800s, a young Henry Shaw used to ride west on horseback from his fledgling hardware store on the St. Louis riverfront to the prairie that surrounded the burgeoning city. Awed by the beauty that surrounded him, he wrote home to England describing the splendor of the tall prairie flowers and grasses that engulfed him as he rode. He was, in fact, so enamored and inspired that, as his fortunes increased, he began buying the land he traversed, later transforming the property into the Missouri Botanical Garden and Tower Grove Park. It is possible to get a hint of the breathtaking beauty that inspired Henry Shaw when you turn your car into the long, winding driveway leading to the hilltop residence of these West County homeowners. It is simply instinctive to slow the car, step back in time and immerse your mind, body and 21st century transportation in the long meadow prairie that surrounds you. It is an ocean composed of wave after wave of golden black-eyed susans, purple blazing star and lavender bee balm and hyssop. Butterflies, bees, birds and a soft breeze flutter through the flowers and native grasses and wash the landscape with life. The impact is just what the homeowners hoped for. 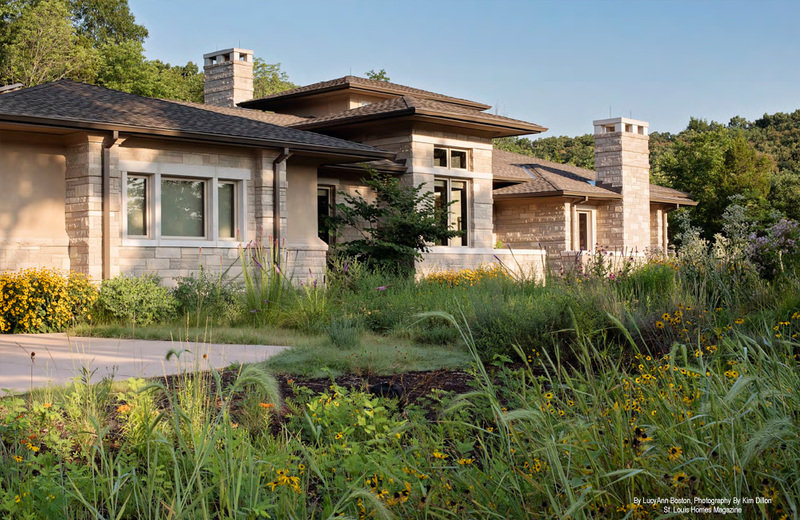 After three years of painstaking effort, they are beginning to realize their vision of anchoring the Frank Lloyd Wright-inspired, Prairie-style home they dreamed of and designed to the landscape to which it is meant to belong. While the natural prairie had thousands of years to put down roots, these homeowners had much less time to plant their feet into the soil so that every view from their window-filled home brought the beauty and color of the prairie indoors. Long knowing what they planned to do, they spent several years looking for just the right piece of property and in 2008 purchased the seven acres of land on which their home rests.. They took time to hone the plans for the Wright-inspired home built of natural wood and stone, finally breaking ground in early 2013. But all the while they realized that the home they envisioned was not compatible with the more formal, boxwood-predominant, Williamsburg-inspired gardens of their previous homes in Pennsylvania and later Chesterfield. In preparation for the move, they look a class in shade gardening at the Missouri Botanical Garden, hoping to learn as much as possible about plants that would thrive in a woodland setting. But they also sought something more than “the traditional natural landscape of native shrubs and grasses. 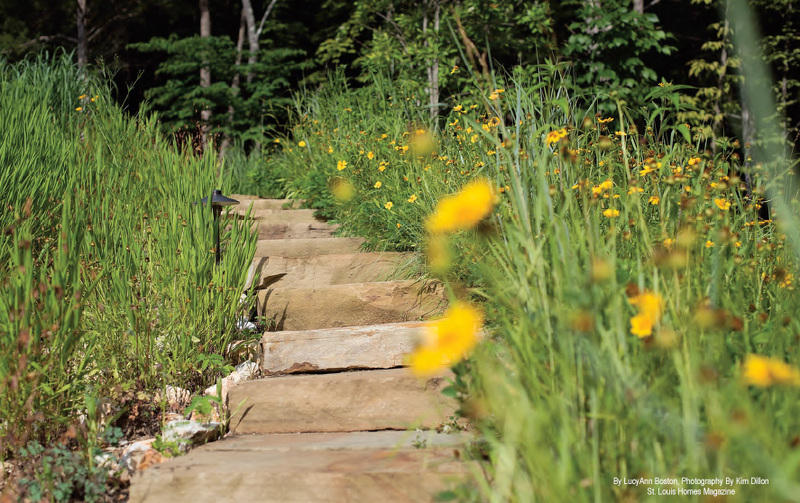 We wanted wildflowers with the grasses,” the homeowner explains. As luck would have it, the late Cindy Gilberg taught that class. An expert in perennials, Cindy also had massive credentials as a native plant guru and worked in the horticultural department at the Missouri Botanical Garden’s Shaw Nature Reserve. She also wrote a monthly column on Missouri Natives for the Gateway Gardener. It was a match made in horticultural heaven. As the couple explained their ideas, Cindy began making suggestions and the project blossomed. Way too much to dig into at once, Cindy created a series of 10 zones up the driveway, around the house and into the woods that could be planted over several years. Each has a slightly different feel depending upon the proximity to the residence. While the free-form long meadow filled with flowers and grasses leads up to the house, a more a disciplined landscape of North American natives including dwarf “Little Lamb” hydrangeas, “Matrona” dark-leaved sedum, false indigo, serviceberry, native columbine, dwarf “Little Star” black-eyed susan, dwarf ‘Boulevard’ St. John’s wort, “Karl Foerster” feather reed grass and “Tara” prairie drop seed surrounds the house itself. The couple also is having the fun of seeing their landscape change from year to year. “Every year it’s different depending upon where the birds, bees and animals have carried the seed,” he adds. Some of the landscaping changes are part of the plan. 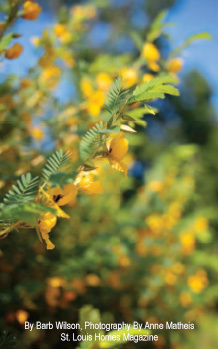 On hillsides to control erosion, for instance, the team used seed mixes with quick covering natives such as ferny-leaved, yellow-flowing partridge pea that, even though prolific, allows slower-growing natives to become established. As time goes on the partridge pea will fade permitting the other selections of more diverse wildflowers to take over. The homeowners also have discovered the landscape co-exists with the local wildlife. White-tailed deer bed down by a retaining wall in the long meadow prairie each night, but, for the most part, leave the native wildflowers alone, except for occasionally nibbling on particularly tasty New England asters. The landscape may be low-maintenance once it is established, but it is not without maintenance, he emphasizes. The couple tries to do as much as they can themselves and relies on the stewardship of DJM for plantings that they can’t or don’t know how to do. Once planted or seeded, they allow nature to take its course on most of the property, neither watering nor fertilizing. Near the house and around the pool, however, they have installed a drip irrigation system to supplement rainfall until the plantings become established. They both admit they are continually learning, filling their library with books on wildflower gardening and native plants and regularly visiting the Missouri Botanical Garden and Shaw Nature Reserve to take additional classes. See www.stlouishomesmag.com for resources and additional photos.